Beverly Joyce O’Neal, age 76, of El Dorado Springs, MO, passed away early in the morning September 24, 2013, at Community Springs Nursing Home. Joyce was born the third child of Lloyd and Wilda Whitesell on March 18, 1937, near Filley, MO. 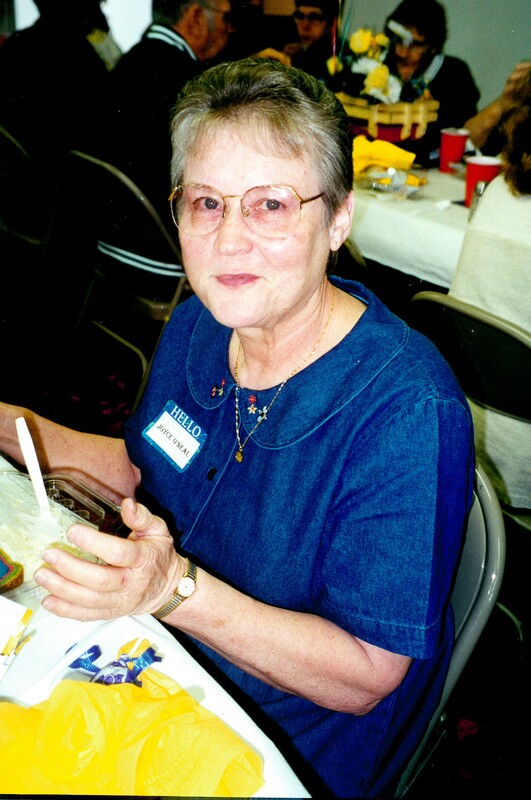 Joyce attended schools in the Stockton area and El Dorado Springs. She graduated from high school in El Dorado Springs in 1955. She was very popular and had many friends. She was the football homecoming queen her senior year. While in school, she worked at Evans Drug store. Joyce was married first to Leonard Beason. To this union twin daughters were born. Shauna Lea was born first and then came Kauna Lynn. She was later married to Richard O’Neal. Except for a short time in Kansas City, Joyce lived in El Dorado Springs. She worked at the Ben Franklin store, Nelly Don, and International Shoe. Joyce worked for many years at Dunbrooke. She quit for a short time and worked for Witt Printing. Later she went back to Dunbrooke for several more years. When she retired in 2002, with thirty-two years of service, she was a floor supervisor. Joyce was preceded in death by her parents, Lloyd and Wilda Whitesell, and her daughter, Kauna Lynn Gerster. Joyce is survived by her daughter, Shauna Elliot and husband Owen; brother, Darrel Whitesell and wife Phyllis; two sisters, June White and husband Wayne, and Diana Hamilton and husband Sam; three grandchildren, Angi Cluck and husband Scott, Autumn Gerster, and Kade Gerster and wife Kasee; and two great-grandchildren, Kausha and Blake Cluck. Funeral services for Joyce O’Neal were held at 10:00 a.m. on Monday, September 30, 2013, at the Church of God (Holiness). Rev. Brent Bland and Rev. Joe Trussell officiated and Strong Tower Quartet provided music. Burial followed at Mound Cemetery under the direction of Bland-Hackleman Funeral Home.